A member of the Salisi/Laglag Susi Gang was caught and arrested yesterday in Paranaque. 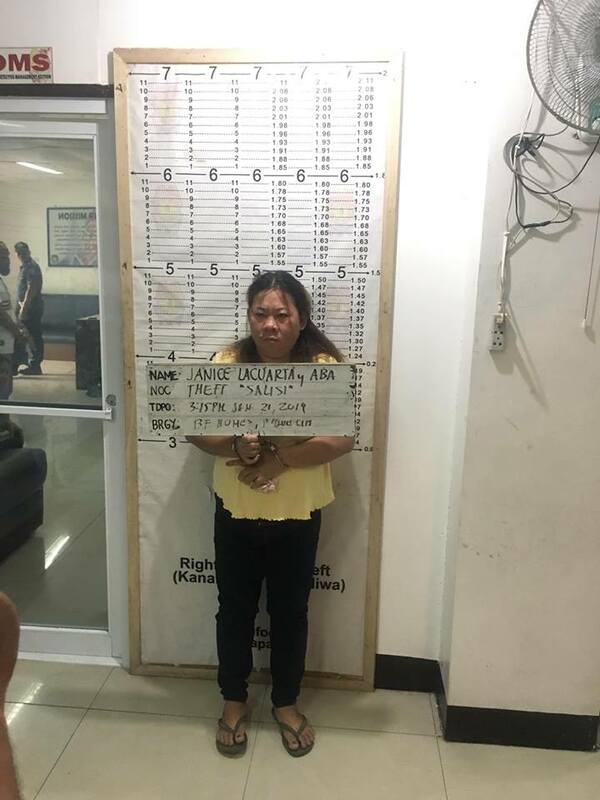 As posted by a recent victim on Facebook, the lady suspect who victimized her last October was caught when she and her cohorts tried to victimize another resident near Tropical Hut in Barangay BF. In her post, she said that BF Homes Police turned over the suspect to the Paranaque Police headquarters. “The other culprits fled immediately,” said the former victim who had her bag stolen in Evacom late last year. Photo from the recent victim. This was also the person who was suspected to have taken a Korean’s bag in Witches Brew in BF also last year. The woman was caught when she and her other gang members tried to get the bag of another woman while she was having her car battery changed. “We are pursuing the cause and hopefully get further information about the other gang members,” said the Evacom victim, saying the suspect kept silent and acted like she didn’t know anything.